Highway Rider - Pedal to the metal! Did you ever get the urge to go an a highspeed race without even a second thought? Highway Rider is exactly that! Caution: the high-speed races require fast reflexes and able hands. This game that you can play now and again gives you some readily accessible game-play. Whether it's as fun as it seems to be will be exposed in today's app test review! Highway Rider's authorization showed no abnormalities. It's often been said that even though there are mobile games, which offer complex and comprehensive games options, the ones you play now and again still have a lot of popularity. Users don't always want to go on epic quests or manage a whole city. Highway Rider is the perfect noncommittal and casual now-and-again game! 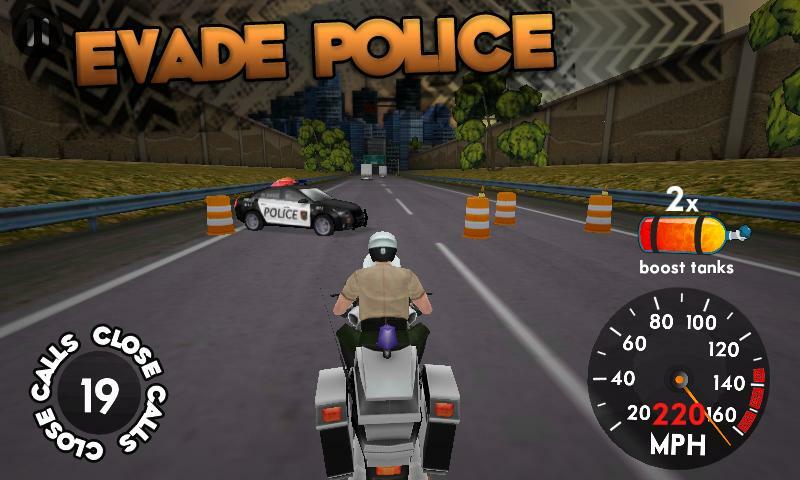 The aim and purpose of the game are quickly explained: you hop on a motorcycle and race down a highway, while dodging cars and obstacles while driving as close to them as possible. There are points as well as speed boosts. What's important is to go faster and faster, perform outstanding maneuvering and get as far as possible. The acquired points come in the form of gas caps, which you can use either for a new character or nitro boosts. If you happen to crash (which you undoubtedly will) the racer will fly spectacularly through the air and injuries will be shown bone-by-bone; quite the morbid site! Aside from the normal arcade mode, there is also the fugitive mode, where you are being chased by the police who try to block you. This makes the whole thing just a tad harder. 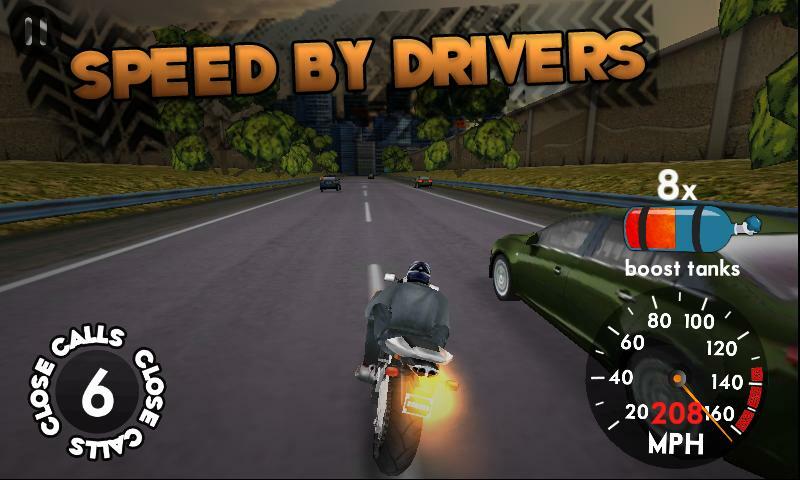 Basically Highway Rider's game-play is concentrated on the essentials, offering it at highest speeds and with lots of adrenaline. For those seeking a complex game, stock-full of variety, this isn't the game for you. On the other hand, if you want a relaxing and entertaining highscore chase, which doesn't require a huge learning curve, then you're definitely on the right track. 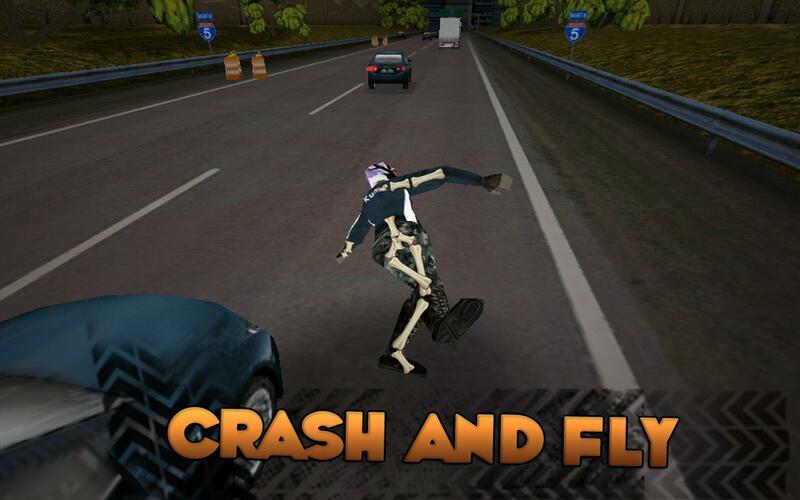 Highway Rider is fun and offers always a few minutes (or more) of fun! 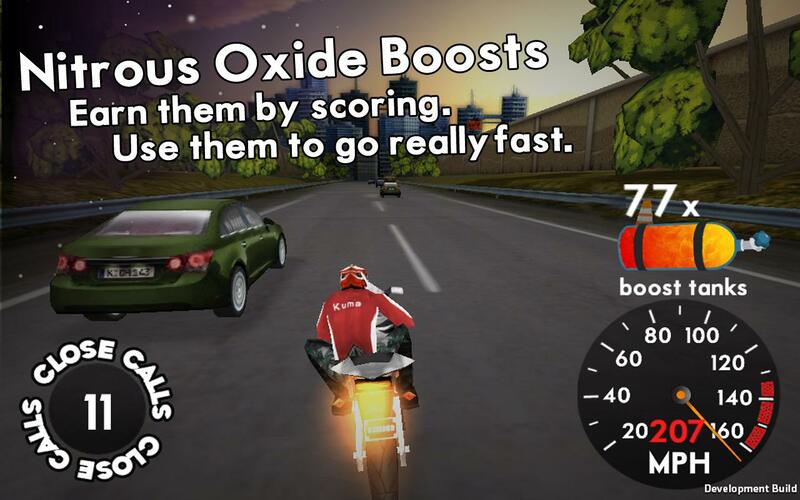 Highway Rider's graphics will definitely not exhaust modern devices. Though the game is three-dimensional and doesn't look too bad, you will notice things like two-dimensional trees and very blurred textures. On the other hand, this does present an advantage: Highway Rider works also on older devices. Just like the game itself, the controls are limited. To steer, you just tip the device and to use the boosts, you just tap on the right side of the screen. It works well. The last update for Highway Rider had one or two graphic errors and very few crashes. Other than that it ran stably and quickly. 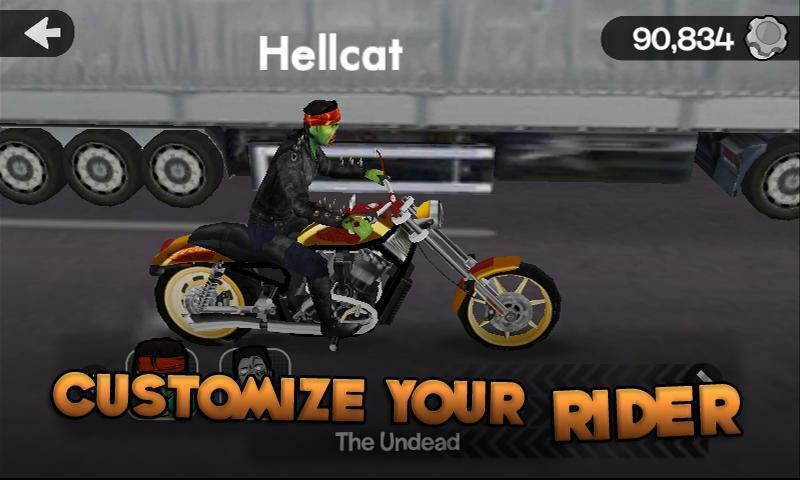 Highway Rider is free in the Google Play Store. The gas caps can be bought, but they won't really bring you any real advantages. Buying is therefore completely up to you! I agree game is good with regard to graphics and physics.